I’ve never been to the Levain Bakery in New York City, but I have seen an awful lot of their baked goods on Instagram and copycat recipes on various food blogs. 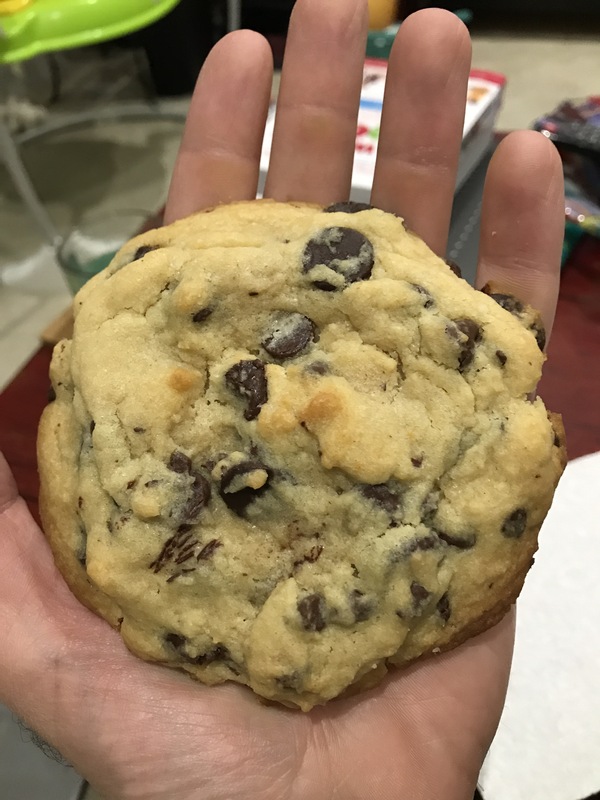 I was curious to see what all the fuss was about, but, honestly, what could be bad about a massive chocolate-chip cookie that’s soft on the inside and crisp on the outside? After reading through a number of recipes to choose from and the related comment sections, I decided that this recipe was the best. 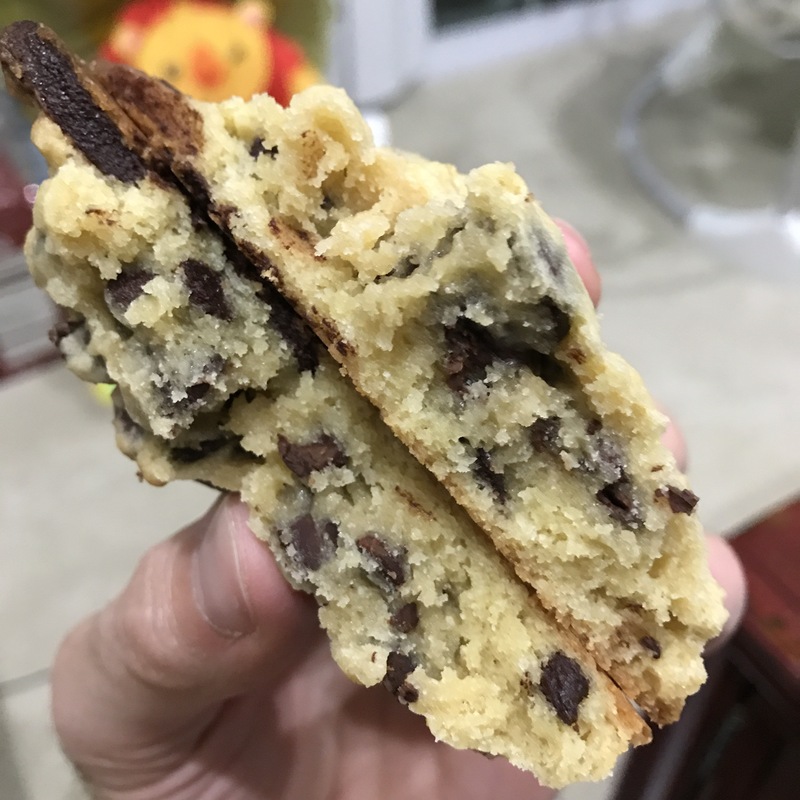 This particular blogger has attempted many variations of this cookie, and she feels like this is the closest representation of the real thing (she’s also tasted the real thing). It’s a fairly easy recipe. There is no time waiting for room temperature butter, which I usually find is a baking momentum killer. There is, however, some chilling time required, but if you plan in advance, these are easy to prepare the night before and bake the next morning. On another food blog, I noticed some readers complaining that their cookies spread too much despite ample chilling. Many of them had elected to omit the walnuts. Since I don’t really like nuts in most desserts, I decided to replace the walnuts with more chocolate chips. Clearly, there was not much of a spreading problem. I did have some reservations with the bake time. 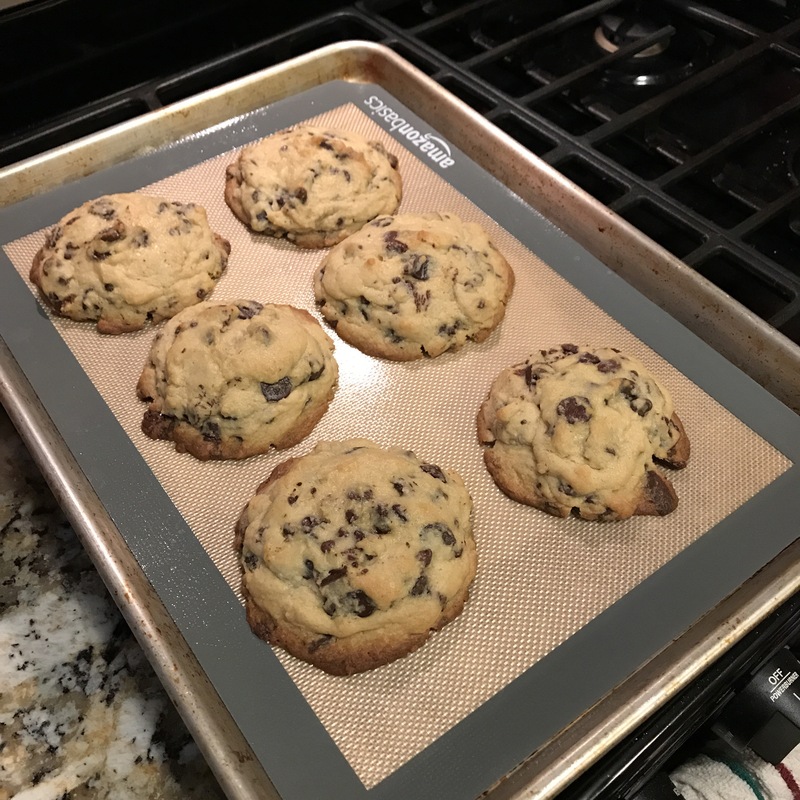 The recipe says to bake at 375 degrees for 18 minutes, which seems like a high temperature for a long time (but these are HUGE cookies!). My gas oven temperature varies greatly during baking, so I kicked it up to 380 degrees for a higher average temperature (seriously, it oscillates by maybe 25 degrees). Even still, I decided to bake the cookies an extra two minutes because I thought the edges and tops should be more browned (and the tops were not very browned). 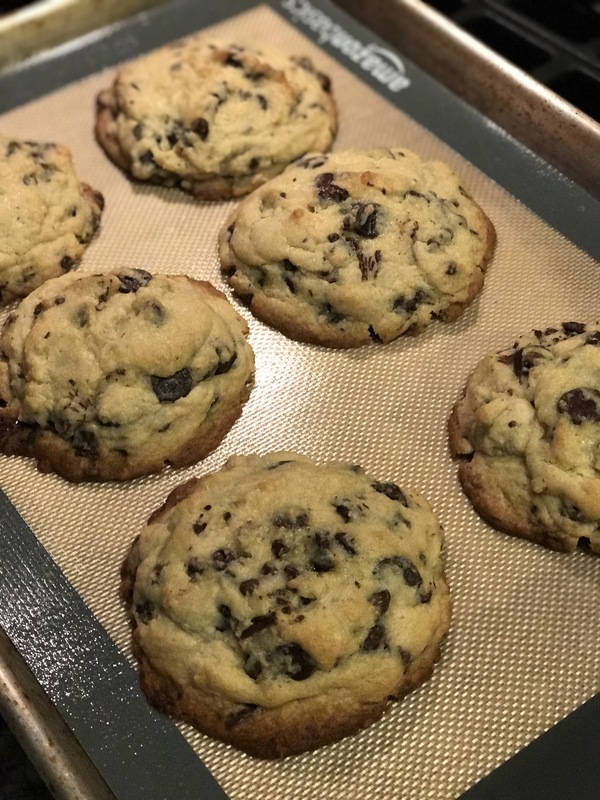 I think these cookies were the best chocolate chip cookies I’ve baked, which is very high praise. My previous two favorites (here and here) are still high up on the list, but this cookie is at a different level. Those are the best, basic, remember-when-you-were-a-kid chocolate-chip cookies. This one is their mother. In a large bowl, mix flour, salt, baking soda, baking powder, and milk powder. In the bowl of a stand mixer with paddle attachment, beat the butter on medium speed until it comes together and creamy but still cold. Add the sugars, beating until mixed. Gradually add the eggs and vanilla, scraping sides of the bowl as needed. Turn speed down to medium low, then gradually add the flour mixture until just incorporated. Dump batter onto a large flat surface and divide into 8-12 ragged pieces. Place pieces in a baking pan and chill at least 2 hours (preferably overnight, or freeze). 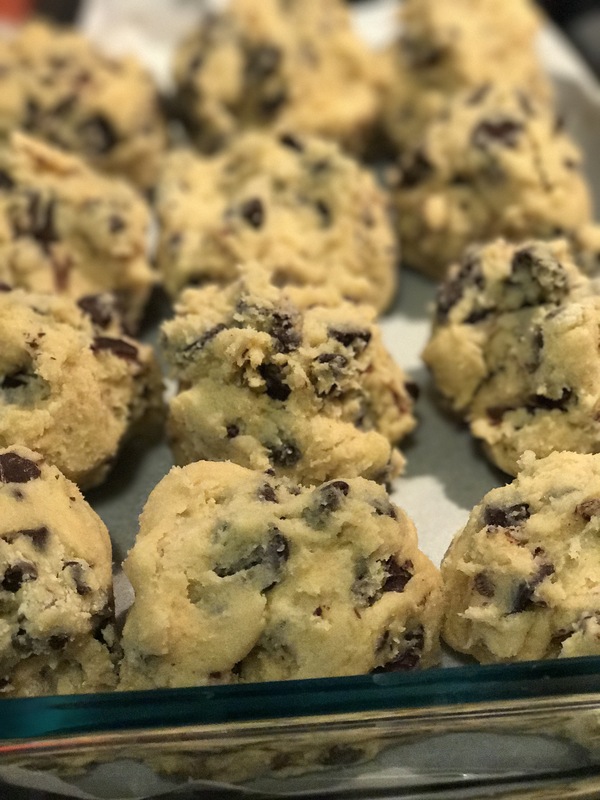 Arrange cookies on a heavy duty cookie sheet, then bake for 18-20 minutes. Let cool for 5 minutes before removing to a wire rack to finish cooling.